Qantas and Virgin Australia appear to have reached an uneasy armistice in their domestic capacity war that added nearly 8% in seat capacity in the year to 30-Jun-2013. But a stay in hostilities is likely to be temporary at best, with neither side laying down arms. Indeed, after Qantas offered an olive branch by stating it would limit its domestic capacity increases to between 1.5% and 2% for the first half of FY2014, Virgin Australia responded the next day by declaring it would grow capacity by up to double that amount. And that does not include any increase that its newly acquired 60% subsidiary Tigerair Australia may have planned. Virgin Australia CEO John Borghetti also provocatively stated that Virgin Australia Regional Airlines, bolstered by the acquisition of Perth-based Skywest, will soon seek to break more Qantas monopoly routes, placing more pressure on fares and yields. Both Qantas and Virgin Australia have been bruised by their domestic encounter with results for the financial year to 30-Jun-2013 showing Virgin Australia’s domestic profit fell to AUD44 million (USD40 million) for FY2013 from a AUD93.2 million (USD83.4 million) profit in FY2012, while Qantas’ domestic profit was down 21% to AUD365 million (USD328 million). Those declines were the main theme running through the FY2013 results which saw Qantas post a meagre AUD6 million (USD5.5 million) tax paid statutory profit, turning around a AUD244 million (USD222 million) loss for FY2012, while Virgin Australia plunged to an statutory loss after tax of AUD198.1 million (USD87.8 million). The reduced planned capacity increases indicate that the domestic market will be more stable in the first half of FY2014 as both sides look to allow demand to catch up. Total domestic passenger numbers are trending up, increasing 3.9% for the year ending Jun-2013 to 57.1 million, compared with the year ending Jun-2012 according to BITRE. With the heat coming out of the domestic market in the second half of FY2013, air fares have also begun to increase. Real domestic business fares, which fell sharply during height of the capacity war in the second half of 2012, have recovered to their previous high in Aug-2013 as Qantas and Virgin Australia consolidated their positions. Restricted economy fares are a little higher than a year ago, but the more cyclical best discount economy fares are little changed from Aug-2012 and remain well below their Aug-2011 level. Virgin Australia kicked off the capacity war in 2012, aimed at growing its share of the corporate and government market beyond the 20% target achieved in FY2012. The carrier increased capacity by 6.3% in FY2013 as it moved to consolidate its hard-won share of the premium markets by strengthening its position on the trans-continental routes with the introduction of A330-200s replacing 737-800s, as well as thickening its presence on the golden triangle routes of Sydney, Melbourne and Brisbane. Total seat capacity on one of the key business routes, Melbourne to Perth, increased by 22.7% in the year to Jun-2013, but passenger numbers were up just 15.2% leading to load factors dropping 5ppts. Virgin Australia has invested heavily in product and services to attract corporate and government accounts including transitioning to the single SabreSonic reservation system in Jan-2013 which has significantly improved the carrier’s exposure to the business market through travel agents. The move, which came with some inevitable initial teething problems, has paid off with yields doubling in Jul-2013 compared to Jul-2012. Virgin Australia has also reportedly won a major media account from Qantas, but Qantas states it has won back eight corporate accounts from Virgin Australia during the financial year, including Fortescue Metals. Qantas has also signed 84 new accounts, renewed 111 and lost seven. Virgin Australia’s close ties with Singapore Airlines and Air New Zealand have been crucial in its ability to grow its business traffic. The carrier’s trans-Tasman alliance with Air New Zealand was extended for another five years in a final decision by the Australian Competition and Consumer Commission on 03-Aug-2013. The alliance had challenged a draft decision which allowed for only a three year extension, two years shorter than a similar alliance between Qantas and Emirates on the route approved earlier in 2013. Qantas’ response to Virgin Australia’s advances has been emphatic, using Jetstar as its main weapon to target Virgin Australia’s core leisure market along the eastern seaboard and at the same time defend the group’s 65% profit maximising market share. Jetstar increased capacity by 11.9% in FY2013 while demand grew 9.1%. Qantas mainline, which added 3% domestic capacity during FY2013, focused its efforts on fighting Virgin Australia on the trans-continental routes by upgrading its Sydney and Melbourne to Perth weekday services to A330s. But Virgin Australia has been given free rein to expand on the Brisbane to Perth route which Qantas continues to be served with a mix of 737-800 and 767-300s. Total passenger numbers on the route increased by 6.8% in FY2013 to 981,000, on increased capacity of 18%. Business passengers have benefitted from the increased competition as both airline groups invest heavily in upgrading inflight products, particularly business class cabins and airport lounges. Qantas has revealed its new lie-flat business class seats which will be fitted to its domestic A330 fleet by the end of 2014. Qantas has also appointed hospitality group Accor Australia to manage its domestic lounges and Qantas Club at Sydney, Melbourne, Brisbane, Perth, Adelaide and Canberra airports. Accor already operates Qantas’ international lounges at Sydney, Melbourne and Singapore under the Sofitel brand. The carrier is reportedly also upgrading its invitation-only Chairman’s Lounge in Melbourne to bring it in line with the exclusive lounges in Sydney and Canberra. Virgin Australia is thought to be planning a similar exclusive offering aimed at the most senior executives and officials. The second half of FY2013 saw the competitive focus move to the higher yielding regional domestic market, with Virgin Australia’s acquisition of Western Australian carrier Skywest providing the carrier with the clout to compete with Qantas’ dominant position in the regions and accelerate its growth in the lucrative fly-in-fly-out (FIFO) mining charter market and the corporate charter market. Qantas has the more expansive domestic network of 62 destinations compared to Virgin Australia’s 43 points after the Skywest acquisition. While regional traffic is growing, Virgin Australia’s efforts to enter some markets are being hampered by regulatory restrictions on many routes in the interest of service stability. Qantas has also moved to capitalise on regional growth and defend its positions on the network with the addition of four Q400 turboprops and another five 717 regional jets. Western Australia has become the focus of the fight for regional market share as Virgin Australia completes the integration of Skywest and challenges Qantas. But BITRE data shows that passenger demand growth during FY2013 was strongest on regional routes in the east of the country while several routes in Western Australia showed reduced demand. The greatest increases in passenger numbers in Jun-2013 compared to Jun-2012 were all on regional routes, led by Melbourne-Sunshine Coast (up 39.1%). Other large increases were recorded on a number of other routes, including Newman – Perth (up 28.9%), Ballina – Sydney (up 28.0%), Coffs Harbour – Sydney (up 19.8%) and Brisbane – Gladstone (up 14.4%). Melbourne-Sunshine Coast and Coffs Harbour-Sydney have both benefited from the launch of services by Tigerair Australia in Mar-2013 and Feb-2013 respectively. Capacity on the Newman-Perth route has grown from 5,500 one-way seats per week in the last week of Jun-2012 to 7,252 seats a year earlier. Most of the capacity was added by Qantas which increased its seat numbers by 1,176 to 6,004 seats. Virgin Australia added 414 seats per week to 1,086 seats and will add a further 822 seats by Nov-2013. On the Ballina-Sydney route Jetstar has defended its dominant position in response to a smaller capacity increase by Virgin Australia, but Jetstar’s capacity swings wildly throughout the year between about 1,600 one-way seats per week and up to about 3,740 seats against Virgin Australia’ steady offering of about 1,250 one-way seats per week. Virgin Australia and Jetstar have largely matched capacity increases on the Brisbane-Gladstone route adding a combined 835 one-way seats per week on the route taking the total to 7,165 seats. Routes with traffic decreases in Jun-2013 compared with Jun-2012, included Ayers Rock – Sydney (down 16.4%), Perth – Port Hedland (down 13.5%), Geraldton – Perth (down 11.9%), and Brisbane – Mackay (down 11.5%), according to BITRE data. Jetstar replaced Qantas as the operator on the Ayers Rock-Sydney route in Jun-2013 and reduced the group’s capacity by 480 one-way seats per week to 710 seats. Virgin Australia has moved to take up most of the capacity given up by the Qantas Group by progressively adding 375 seats by the end of Oct-2013. While passenger numbers between Perth and Port Hedland are down 13.5%, capacity has reduced by about half that amount due to Virgin Australia reducing capacity by 762 one-way seats per week between May-2013 and the end of Jun-2013 to 1,248 seats, while Qantas has maintained capacity at about 6,000 one-way seats per week. Virgin Australia has maintained about a 200-seat per week advantage over Qantas on the Geraldton to Perth route. Tigerair Australia has also made its presence felt on the Brisbane-Mackay route where the carrier added 776 one-way seats in May-2013 to a total of 2,541 seats. Virgin Australia has also grown capacity on the route over the course of the year to Jun-2013 from about 4,000 seats to about 6,300 seats while Jetstar has reduced its capacity slightly to about 4,500 seats. 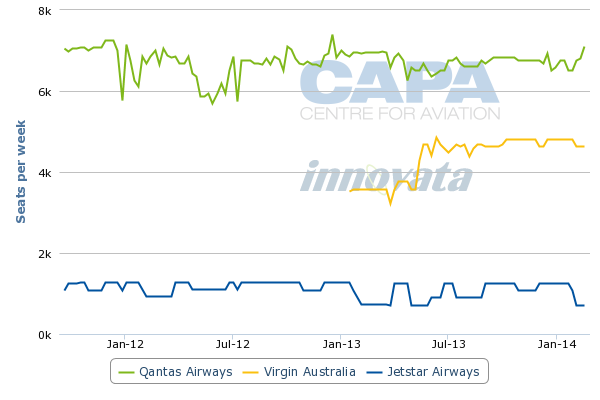 Qantas and Virgin Australia have pulled back strongly on their domestic capacity growth aspirations for the first half of FY2014 indicating that market will see a period of relative stability with rising airfares helping to rebuild profits. But with Tigerair Australia due to unveil its strategic plan soon the gloves could come off again in the second half of the financial year. Tiger Airways Holdings Group and Virgin Australia have committed to investing AUD62.5 million (USD56.9 million) to fund Tigerair Australia growth from a current fleet of 11 A320s serving a network of 12 destinations, to at least 23 aircraft by 31-Mar-2018, with the potential for it to grow to 35 aircraft. It is difficult to see how that much capacity will be absorbed in a market where cheap fares are no longer able to stimulate significant additional demand. Any additional capacity will almost certainly provoke a strong defence response from Jetstar, putting further pressure on yields and profits. 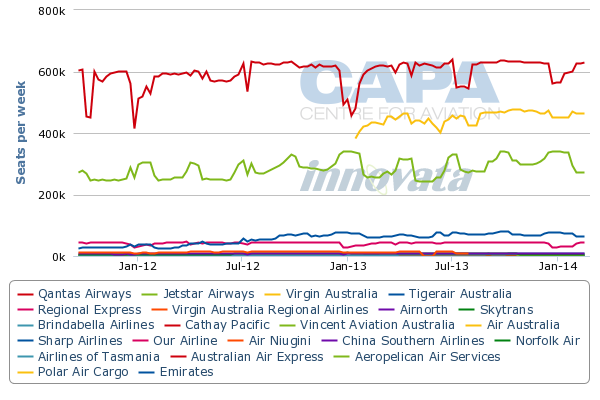 A period of significant capacity increases has come at the expense of profits for both Qantas and Virgin Australia. The carriers will now look to consolidate their positions in the important business market, while Virgin Australia has its immediate sights set on taking a greater share of the high yielding regional market, particularly by introducing competition on Qantas monopoly routes. But the future direction of capacity growth and as a result fares and profitability will be determined by how Virgin Australia elects to deploy Tigerair Australia, which has allowed the group to re-enter the LCC market. Tigerair Australia’s lower cost base offers Virgin Australia the opportunity to generate new revenue. But in a low cost market that is close to saturation, the key will be how quickly Tigerair Australia is allowed to expand and to what degree the carrier will replace less profitable Virgin Australia services.